DIOKNO, Marietta L., 58, of Spring Hill, Florida, died Friday, February 8, 2019 at her home. 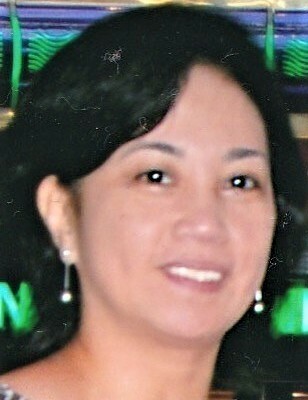 She was born September 9, 1960 in Manila, Philippines and came to this area 12 years ago from Jacksonville, Florida. She was a Registered Nurse, was employed at Oak Hill Hospital for five years and attended Northcliffe Baptist Church. She is survived by her husband of 12 years: Jerry Diokno; son and daughter-in-law: Michael A. & Briana Santos of Oklahoma City, Oklahoma; daughters and son-in-law: Micah & Thomas Bahra of Zephyrhills, Florida, Jessica Diokno and Jasmine Diokno, both of Spring Hill, Florida; two brothers and three sisters. Visitation for family and friends will be held from 4:00-6:00pm, Sunday, February 10, 2019 where Services begin at 6:00pm at Merritt Funeral Home, Spring Hill Chapel, with Pastor David Hope officiating.